This challenge is a lot more difficult, in two ways even. It’s difficult because there’s no guidance and it’s difficult to write a blog about it as I’m not allowed to publish solutions. This time we need to locate invalid packed decimal data and fix it. We need to be aware that only VERIFY is needed to complete the assignment. DISPLAY is not needed. VERIFY produces a return code 12 as a result of finding invalid packed decimal. 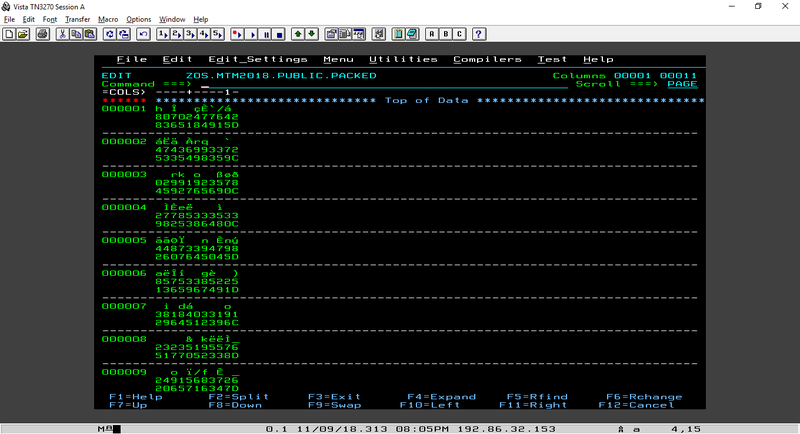 However, the invalid packed decimal records are written in JCL job output. Well it’s pretty obvious that we’ll be using the same JCL as challenge #03 so I guess I can show you that much. I’ll just copy Z30163.JCL(SORT003) into a new file. I guess it doesn’t matter what I call the file. I’ll just navigate back to dslist and create SORT010 and just edit it from there. So I already went ahead and changed the SETVAR to the data set we need and also deleted the DISPLAY statement as we don’t need that. Now what do I need to change? Let’s take a look at the data set. I’ve put hex on for no reason at all. Seriously. So here we see that a row is 11 characters long. That might give you an idea on what we need to change in SORT010. I’ve changed what I needed to change but the records are written in the JCL job output. I tried copying sort004 and write the output that way but I kept getting the error 11 BYTE RECORD LENGTH IS NOT EQUAL TO 80 BYTE LRECL FOR BAD. 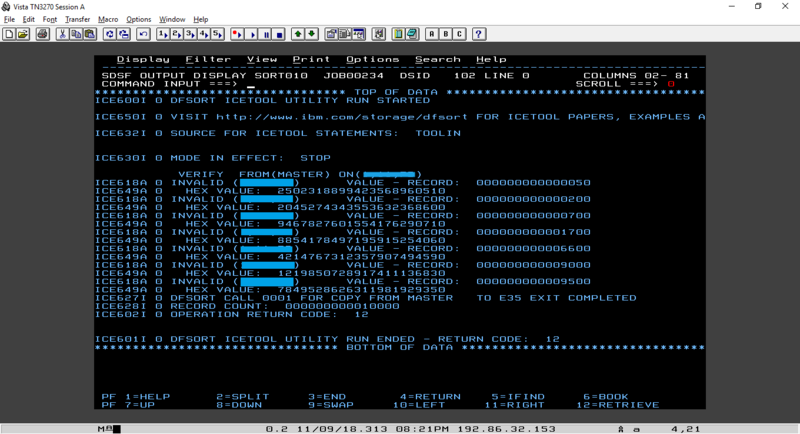 But when you think a little bit, IBM never said to use sort004 didn’t they? And the report is inside the JCL. So why not just XDC it? I don’t think that just simply using XDC is enough? I am confusion. Well I guess that just using XDC is enough. Weird. What’s been easy but not easy for you this week? PS: Did you notice? I published this post at 11/11/2018 11:11. Coolio! You blurred rest of the codes, but you missed one at the top. Thank you, I want you aware that what you’ve done really helps me out. Hi Anonymous, thanks for the kind words! I’m glad I could help! Dude these posts are so helpful thanks so much for putting them up. Really helped when i was stuck in a few challenges and pulling my hair out. how do i get to zos.mtm2018.packed?